For the past twelve week-days at eight a.m. I lay down on a machine like this one. They put a fitted mesh mask over my head to hold it still and the computer directs the machine to shoot beam of radiation into my brain. I have two more to go. They started therapy while I was in the hospital, so I was loopy and stoned and in an almost playful place in the madness. At the same time, I knew I needed a way to think about what was happening. All high-tech and sparkey? Lazer shootout? No. Dance. 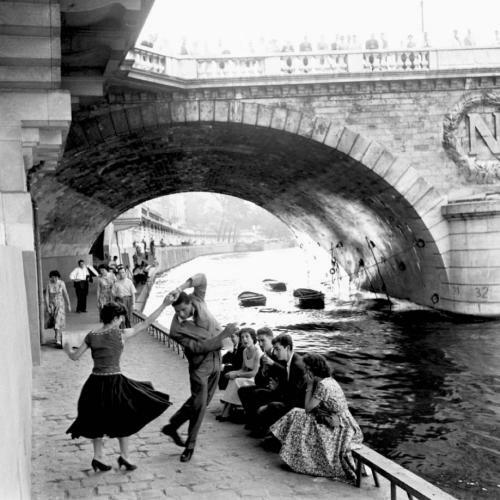 Every treatment I imagine a couple dancing on the streets of Paris. The music is an accordion waltz and in my mind’s eye it is a sunny morning after a rain. As the machine moves around, they dance and spin on the cobblestones of my brain, shining and bright, light and graceful. But my lady is a ballerina en pointe with her partner, and the grace and joy of the dance also includes her strength. When she comes to a lesion, she hits it en pointe, and makes it spark. The turns and glides, the little hops of the dance are punctuated with the almost explosive power contained within the little dancer. My current madness manifests in art. Its silencing my critical/cynical voice. I tried to do this earlier when I walked into a ballet class at 42. Dance was going to be part of my dream post-cancer life. Instead, dance is helping me save the life I have now, and move into the future. My imagination dances through my treatment, and it will help me heal later. Todd and I are going to learn how to waltz.